Yr10 Parents meeting for parents and students involved in the 'Take your Sons and Daughters to Work Day' event. Meeting at 7pm in the hall on Wed. 19th April 2017. 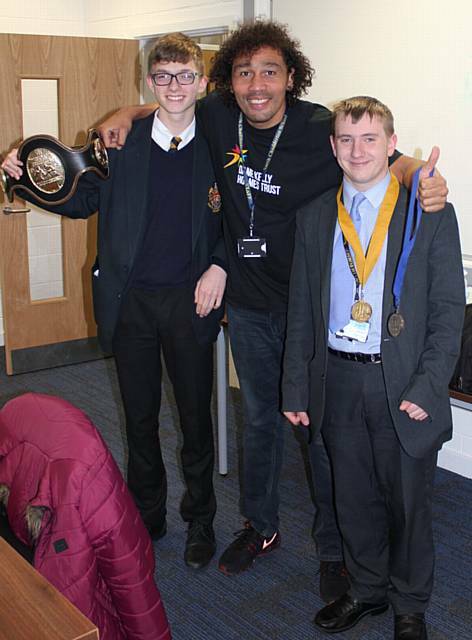 A PAIR of students from North Chadderton School have been selected to take part in a life-changing scheme with a world-class athlete mentor. Adam Hurst (17) and Callum Townsend (15) have been chosen for the AQA Unlocking Potential programme, run by exam board AQA and the Dame Kelly Holmes Trust. The young people will be mentored by former boxer Courtney Fry. North Chadderton School is one of 28 on this year's programme, selected from 100 applicants. AQA Unlocking Potential provides mentoring for young people aged 14 to 19 who have faced personal challenges or disadvantages. Students are paired with specially trained mentors who have competed at world-class sporting events ­- including the Olympics and Paralympics ­- and have overcome their own significant personal challenges. Courtney Fry will provide personal mentoring for the students over eight months to help unlock hidden attitudes and skills. They will also help the students to deliver a community project towards the end of the programme. Elizabeth Healy, Year 11 senior progress leader at North Chadderton School, said: "The collaboration with AQA and the Dame Kelly Holmes trust will help to raise the profile of diminishing the differences at North Chadderton School and show that every pupil, regardless of their ability or background, is capable of success. "Our focus at North Chadderton is to encourage a growth mindset and improve student resilience by challenging pupils in and out of lessons, this programme helps build the foundations of refusing to give up when work gets hard." Dame Kelly Holmes Trust is a national charity supporting young people facing disadvantage through high-impact mentoring programmes led by world-class athletes. The trust currently deploys athletes onto a diverse range of personal development programmes and community projects. To find out more about AQA Unlocking Potential please visit damekellyholmestrust.org/young-people/unlocking-potential.